Poems in translation are notoriously hard to discuss, because who wrote them? 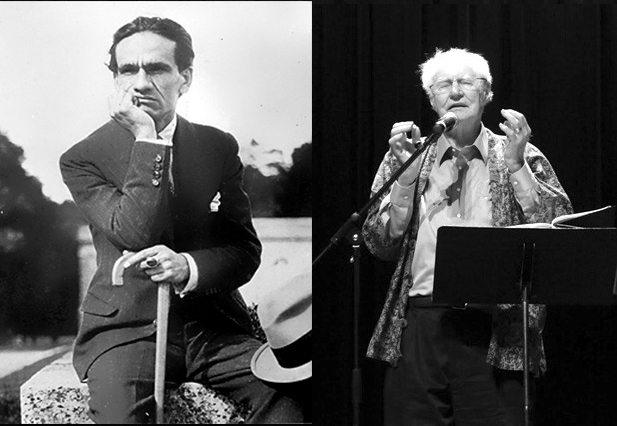 For example I’ve treasured Robert Bly’s translations of Peruvian poet Cesar Vallejo for more than 20 years, even though I’ve heard they’re as much Bly as they are Vallejo. Someone told me Clayton Eshleman’s translations are better, but I find them flat and uninspired. I conclude that I have a personal attachment to Bly’s Vallejo, per se. I suppose it was 1993 or 1994 when I first picked up Neruda & Vallejo. Robert Bly was, or would soon be, my professor at NYU. He was a jolly and frank man, apple-cheeked and barrel-chested, and seemed to have walked to class from the Minnesotan woods. He wore a colorful Native American vest. He reeked of body odor and loved to hug his students with his strong frontiersman’s arms. He would read a poem to us, wait a couple of beats, and read the same poem again. And sometimes a third time. I describe Bly’s charisma as evidence that he might not be the most impartial or academic translator. When he translated, he must have been in the translation. I don’t think Bly wrote anything at all without his own powerful musk at work. Which is all to say that although this book with “Neruda & Vallejo” in large pink letters on its cover and spine, containing translations by not only Bly but James Wright, John Knoepfle, and Douglas Lawder, served as my introduction to a poet who would become immeasurably important to me, such service may have been corrupted by oddball, biased, or otherwise intrusive philosophies of translation. I may have fallen, at least to some degree, for the translators’ charm rather than for the pure fire of the original authors. By way of counter-caveat, the book does contain all the original texts on its facing pages, so readers can enjoy them in Spanish or try their own hands at translation. don’t feel like staying alive, heart. The afternoon is pleasant. Why shouldn’t it be? It is wearing grace and pain; it is dressed like a woman. and staggering blow with a stone; and the glacial pause. . .
so much in me, with the dusk and the sea. With him we go along together. It is getting dark. With him we get dark. All orphans. . .
owns one smooth oil against two vinegars. owns two rivers against a number of seas. owns one piece of steel against two daggers. owns one deep fire against two craters. and coming upon me, each moment, in her shoes. with spurs behind the kitchen? goes galloping on her precise little stone. never returns to her trunk? Funny to imagine singing this, especially the closing line: “But she does look and look for me. This is a real story!” But I love it so much. I wouldn’t have become interested in writing my own poetry if not for Vallejo via Bly, or at least not interested in the way I became interested in it, with a passion for strange, surprising syntax that references love and God amid a din of microsymbols. Moments of enlightenment in a whirlwind of worldliness. Perhaps more importantly, Bly’s Vallejo gave me a voice I’d never heard before in literature. It sounded so personal and direct, while at the same time keenly aware of its own limitations, and it also clunked, strangely. All I wanted was a poetics that was unafraid to clunk. I felt I could be at home there. 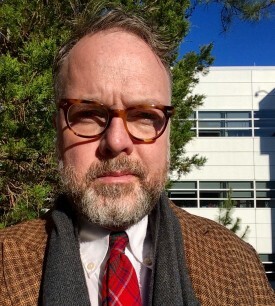 Aaron Belz has published three books of poetry: The Bird Hoverer (BlazeVOX, 2007), Lovely, Raspberry (Persea, 2010), and Glitter Bomb (Persea, 2014). He lives in Hillsborough, North Carolina.